WhenI was young, I used to make tombstones to hang on the Christmas tree. A strange pinch-faced anxious child, they were my playthings. For me, death was part of life. And so it was, this very afternoon, when I turned off the road to Pirbright in Surrey, England, into a veritable city of the dead. I did this by accident. I was on my way to attempt to persuade the owner of the cemetery to let me take photographs. But I turned in too early and found myself in this deserted, and yet most crowded, of cities. 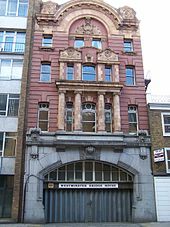 It has passed into legend, yet not even my railway buff of a husband knew that the tall building outside Waterloo Station was used to provide a one-way ticket for coffins, away from The Big Smoke and into the countryside. The station, situated near Westminster Bridge Road, was called London Necropolis Station. This is its second incarnation; its first was demolished for redevelopment at the beginning of the twentieth century. Necropolis, for those not versed in Greek, means City Of The Dead. And when London’s dead became too much for it, not only were seven huge cemeteries opened up on the outskirts of London, but the deceased were also offered the chance to commute to Surrey as their final resting place. It was a pragmatic scheme. The London Necropolis And National Mausoleum Company was formed in 1849: the first train running the 25 miles out to Brookwood Cemetery left on November 13th 1854. The allocation of land was vast. Five hundred acres were landscaped, but 2,200 acres of heathland were purchased from Lord Onslow. Mourners would purchase tickets for themselves; and one for the coffin. Trains ran once a day when funerals were scheduled to take place, bringing deceased and mourners down the London and South Western Railway line until it reached Brookwood, a small village in Surrey. And then, extraordinarily, the train would continue on its own line, to two more stations, situated in the cemetery, specifically for the dead and their attendants. South Station served the Anglican community and its chapel: North Station, the non-conformists. It has never ceased serving the city, though the tracks were taken up between 1947-8. I don’t think anything can prepare you for this place. For unlike Highgate and Kensal Green and the bustling London cemeteries, not a living soul stirred here in this Metroland for the dead on a Tuesday afternoon. I steered the old merc down lush emerald tombstone-lined avenues filled with mature trees, through impossibly green English glades bathed in dappled sunlight, past guiding angels, tiny mausoleums and great standing crosses and classical monuments, inscribed in a veritable Babel of languages. It had the eclectic baggage of so many world views living close to each other. Latvian, Serbian, Ismaeli, military, civilian. St Alban’s, Holborn has a section all its own for parishioners, to this day. All human death was there. The London Necropolis possesses a peace close to stasis: the grass was clipped and the roads neatly labelled. And not a living soul in sight. It has been designed as a series of vistas; views one could glimpse and take comfort in, from beneath the black gauze of one’s mourning garb.It was serene, and it was unsettling. Undercurrents and eddies were everywhere though not a blade of grass moved. But it is a working cemetery, and working cemeteries must be discreet. Not only was I unable to take photographs, but I could not even walk through the London Necropolis Graveyard in case my finger inadvertently slipped in the vicinity of the shutter. And like Orpheus: I resolved not to look back. While the internet makes it difficult to tell, I suspect I owe much of this information to author John M Clarke, who has spent decades researching and writing on Brookwood Cemetery and the London Metropolis Railway. You can buy his books through the cemetery website here. Posted in London, Quirks of HistoryTagged Britain, Brookwood Cemetery, england, Funerals, London, London Necropolis Railway, railwaysBookmark the permalink. That is a little chilling! Even more chilling being there, Julie! Ah pity they wouldn’t let you take pics, will google it now – it sounds fascinating! Amongst our clients of Camerahols are a psychiatrist and his wife whose practice is situated in Brookwood. It was through them that I first heard of the Necropolis. I lived in or around Surrey all my English life and never knew of this extraordinary place. The owners keep it quiet, Roger. But what a piece of heritage. Me thinks we are building to an All Hallows Day theme. You should have been there, IE. I’d have loved to take you trailing round the place. Incredible. Amazing – never heard of any of this! I don’t understand the attitude regarding pictures – what awful things are they up to, there? It is a wonder that ‘getting a one-way ticket to Brookwood’ didn’t enter into the currency of language in a similar way to ‘buying a farm’ or ‘bought it’ did. It is a wonder, Col. Private owners of these great old cemeteries have rather a stranglehold on these incredible pieces of heritage, I fear. It demands to be photographed. Very hard to walk away. Or else to wander through snapping away like a turtle, as I once did at Warwick, and only spotting the notices on the way out. Awfully guilty I felt then, I did! I know: have a look at Martin’s comment, below, Rosemary: there’s quite a thread running about it. I’m off to HIghgate next time. I also have many graveyard photos. Most are of family stones, but I also have many that are of others. Steven, the whole business is very English. Private owners can keep us away if they so wish. I hall choose a cemetery run by a trust next time. What an eerie, but at the same time amazing, experience this must have been. Carrie, it really was. Stunning history landscaped for anyone who can get near it. Your command of words is inspiring. Thanks much for the follow by the way! Pleasure, Tina 🙂 And thank you! I would never take a picture of a recent grave: but how could we not take pictures of the graves of Karl Marx and his like? This is beyond the personal. These people are our past, and this is where they ended. It was an incredibly frustrating experience. There is nothing more peaceful than walking around a cemetery. There’s a Victorian one near my house. It is on the harbor, and I love to go there. This one sounds divine. Fitting that they do not allow photos. It is a very beautiful place indeed, Andra. The planting is out of this world. I will hold my hand up and admit to knowing about the trains of the Dead to Brookwood. The ban on photography in Brookwood cemetery and one or two others is because the private ‘owners’ have latched onto the fact that there is money to be made from people who wish to take photos – please see the information at http://www.flickr.com/groups/londoncemeteries/discuss/72157622844546808/ . If people have qualms about respect for the dead then they really should be complaining about this sort of profiteering. Martin, this comment restores my faith n the whole business. I must seek out the big seven, I think, and try there. But it grieves me to leave this piece of heritage behind. Wow, fascinating. I wish you had captured a few Shrewsday shots with an iPhone though. You and me both, Lame…. I didn’t know that photos of cemeteries weren’t allowed to be taken, Kate. I can understand why, but didn’t realise! It’s not universal, Tom. Just a few private cemeteries. If you have time, read 2e0mca’s comment. It is most enlightening. Just read it, Kate, and I understand it better now! A blanket ban seems a bit too heavy handed to me anyway! Too bad you couldn’t get photos – I googled for some images – some said BBC, so were possibly approved – but it looks like a really interesting place, full of atmosphere! It is a stunning place, Patti. I stomped off most disgruntled. How interesting to end up there . . . after getting lost on the way to a cemetary. Oops . . . Wednesday, not Wendy. Here’s another . . . where Wednesday and Pugsly go to school. And it even mentions TelStar! The character of Abby in the tv show NCIS sleeps in a coffin and dresses Goth, and she’s probably the most loved character on the show. I find cemeteries fascinating, too, and enjoy photographing the inventive masonry. As 2e0mca above says, the photography restriction at Brookwood has more of a profit motive than anything to do with respect for the dead. I imagine that will be happening more and more. It really is heartbreaking. I have a real passion for England’s heritage, and to see it kept away from people in this way seems very unequal. It seems to me that the quest for profit over people has distorted the values of many (on a larger scale, all those willing to vote for the greedy profiteer Romney running for U.S. President. Sorry for this short rant, but it’s very upsetting to me). It seems to be a trend, and a downhill-slide one at that. What’s happening at Brookwood is a symptom of that trend. such a shame about the pics..I’ve run into that a few times. Up at Highgate, I took some amazing photos and not allowed to publish for commerical gain..but is word press commerical gain? lol…anyhow..lovely article! Thanks, Susan. Bugger. So Highgate’s out too. Is there any cemetery out there which lets you take photographs, I wonder? None that charge entry. I think you just have to go to the small ones. Highgate publishes postcards and what nots hence the no photog ruling. Pain as I have some amazing shots from there. I might pop them a line and see if I can use them in my blog. non commerical so wondering…..
Just wrote to Highgate…you can delete these comments. You and I would have been fast friends if we had known each other as kids, Kate. While other kids were playing School or whatever, I was playing Funeral. I was fascinated by the whole death thing even then. I’ve never visited the London Necropolis but I would LOVE to. Even without photos, you describe it so well and so beautifully. If I were you, I’d take a little train out to Brookwood when you’re next over and potter round, albeit without a camera. It is utterly extraordinary. Wonderful descriptions. It’s too bad you weren’t able to take photos. I once attended an elementary school that was – as I recall – in front of, or surrounded by, a cemtary. Looking bak on it, it certainly gives one pause. I too, since a child have been enamered with cemetaries. When traveling my parents would stop to have lunch at cemetaries. They said it was quite and shady. I found it peaceful and never strange. I have passed that on to my oldest son. I have plenty of photographs of tombstones and acres of gravesites. Someday, I want to write a book. So much beauty and anguish all in one resting place. It is the terminus, isn’t it? The peace that comes with a life reconciled and rounded off, like the total at the bottom of an accounts sheet. The life may have been sad and the ending tragic, but in the green of that place it’s all one. Tombstones on the tree, eh? Whose? I do find that when we travel I can always intrigue my boys by suggesting that we go visit the graveyard. 😀 I don’t recall ever adding too much identification to the tombstones, Tammy. I genuinely can’t remember what was going on in my head at the time. But the grown up version was there, the other afternoon…. I think it’s worth remembering that Brookwood has to cover its costs somehow anyway it can. There’s not much money and a lot of overheads in this cemetery business! Incidentally, I remember reading a terrific novel based around the crew of the train services to Brookwood – the Necroplis Railway by Andrew Martin. Hi Daniel: thanks for taking the time to comment. I heard of the Andrew Martin novel as I was doing my research: must look it out, thanks! Another great source- putting the London Necropolis in a wider context – is Catherine Arnold’s London and Its Dead – a really wonderful read. I suppose that, when it comes to something as significant as this heritage site, I believe there are better ways to preserve the past for all of us than this. Private landowners are perfectly at liberty to maintain a stranglehold on pieces of our history which, if they were owned by a charitable trust, would illustrate so beautifully the shift in attitudes and solutions in Victorian England. It is a perfect example of the marriage of the social and technological to meet a need, but even though I came brandishing £20 for a permit and a donation, I was unable to photograph it- or, in the end, even walk round it. That is not equitable, and I believe there should be legislation to preserve these places of heritage for the British people. Trying to catch up after a week away, Kate, and here you are telling me about coffins and cemeteries and coffin trains. Fascinating. Then, again, I’ve always been fascinated with cemeteries. My dad would tell of when his father died, during the Great Depression, of tuberculosis. He was, as was the custom then, waked in their house. A hearse took the coffin to the church, then, after the service, to the train stop. They all boarded the train and road out to the cemetery in the suburbs to bury Papou. I’m curious now as to whether or not it was a coffin train. How interesting! The author of London Necropolis, John Clarke mentioned to me that there are just such arrangements in other large cities – the most notable at Rookwood in Sydney, Australia. It seems the out-of-town necropolis was quite the thing, made possible by the iron horse. Perhaps with your brain stuffed full of trivia, you already know about Vermont’s Hope Cemetery? While it hasn’t the grim fascination of a Necropolis station, it’s a beautiful and happily photographable resting place in the mountains. It’s near the granite quarries, and the stone masons who live(d) and work(ed) in the area fashion rather amazing monuments.